An older folding camera had a deteriorated bellows so I removed the lens entirely and created anew "device." A white LED shining light through a glass condenser lens actually projects a large circle of light on nearby walls. 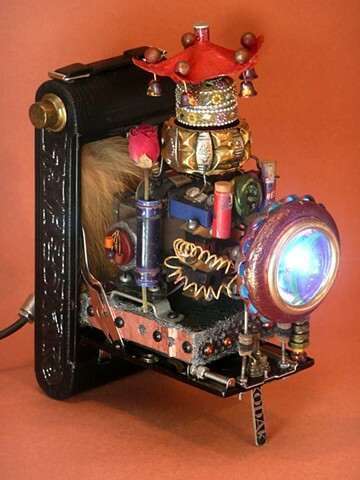 Other elements include a bulky power relay, earrings, vials and tubes, vintage radio parts, oriental-styled pieces of found objects and a little rabbit fur. I used an old TV cable connector to provide power which was particularly charming. Um..to me.